St George Marathon... What can I say... missed qualifing by 4 seconds!! Splits: 7:42, 7:33, 7:27, 7:20, 7:22, 7:14, 7:09, 8:18, 7:56, 7:45, 7:50, 7:29, 7:23, 7:40, 7:09, 7:20, 7:08, 7:36, 7:48, 7:43, 7:11, 7:52, 7:40, 7:42, 8:56, 8:58, last 0.2 mile @ 6:51. But... I sprinted the last 0.3 miles after I realized I was not going to make it... 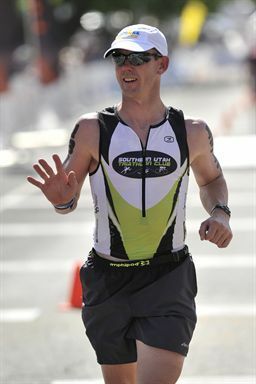 I pucked at the finish, collapsed, told a volunteer off, collapsed again, and walked off the finish line by my own power. My friend Aaron Mettler won the race today!! I am very happy for him! Swam 0.4 miles in the lake for a recovery. My legs are stiff today. Yesterday I had no problems walking and climbing stairs. Today I am struggling. AM - Plyo P90X - we only did the first 35 minutes... we don't want to over do it after a marathon... ouch!! Noon - Cathy and I rode our mtn bikes down the virgin river trail and back. The rain stopped for a short time and we didn't want to get our nice rode bikes dirty. The wind was killing us on the way out, and we were too tired to enjoy the tail wind back. We only got in 16 miles due to the wind abuse!! AM - P90X shoulders & arms, ab ripperx... Loving it!!!!!!!!!!!!! PM - This is suppose to be a recovery week... It started to rain again just as I was pulling out of the garage, so Cathy and I did our bike/run multi-brick transition workout at the gym. We biked 5min, ran 5min for two sets; Biked 10min, ran 10min for two sets; Biked 30 min. Total run = 30 min and bike = 60 min. I did less running just to avoid too much impact, and ran on the treadmill for a softer surface! I made sure I maintained a high candance on the spin bike. AM: P90X legs and back... no ab ripper since we did that yesterday. Noon: Biked 20 miles at a 20.2 mph average. Route: blommington loop, sunriver loop, and southern parkway loop.... pushed HARD through the wind!!! Rode 8 miles to the SHAQ (all uphill), swam 2000 meters, rode 11 miles home with rollers and a big downhill. 19 miles total at a 18.1 mph average. After my run on the ironman course with Craig, I headed on my bike towards Hurricane at a moderate pace. By the time I got to Washington City I kicked it into high gear. I held a good pace until I got back to Washington City and I bonked. It just so happened that I didn't bring any food and 2 and half hours and 47 miles later I was spent. Stopped at the Del Taco for a refresher of a double cheese burger, fries, green burrito, 2 tacos and a drink. I felt much better and finished my last 10 miles at a good pace. I had a guy latch on to me when I was biking through the tough hills. He paid dearly for the free pull and maybe I did too!?!? AM - P90X Chest & Back, and most of the abripperx. Hit the early morning spin class next for 1:20:00 for 27 miles. Lots of speed and hills!!! I had to ring my shirt out twice... what a mess I made!! AM - Craig, Cathy and I did our Ironman Hill Workout at Pioneer Park. There's a half mile loop at the park that goes half up and half down. We ran our 10K pace up and IM pace (9:00) down. We did a 1 mile warm-up(9:00) and a 1 mile cool down(9:01). We did a zippy walk for 2 minutes in between each interval. PM - Biked 32 miles (19.7 mph ave) with Craig and Cathy. We rode the fields loop and then around the southern parkway. Slight wind and a few rollers! Beautiful evening!!! PM - Brick Workout - Craig and I swam along the dam and back at Sand Hollow Reservoir. The wind picked up on the way back and it felt like I was swim in place against the wind current. I still managed a good time of 57:30!! We did a short transition bike ride for 10 miles and a run transition for 2 miles at a 8:00 pace. And... I got in most of P90X this evening of Shoulders & Arms with most of abripperx. AM - Ran with Cathy for an easy 6 miler. We paced just under a 9:30... I brought her along to slow me down, but the poor old girl was tired herself. She worked hard to keep that pace. Then we did 50 minutes of P90X legs & Back... no abripper since I did that last night. Craig and I jump in with a tour ride that other friends were riding. We felt great and we rode up in the front with the leaders. I kept up for over 60 miles. I crushed the hills and thats when I dumped most of the riders drafting off me... :) Towards the end I almost made ground back up to the lead pack, but I had a run to do, so we jumped off that ride and hurried back to our cars for transition. Total distance was 85 miles in 4:00:07 (21.2) Very hilly course!! We transitioned to run the ironman course. When we got to the top of the last hill, we turned around and ran back. Mile 3 we walked the big hill turning onto red hills parkway. AM - Spin for 1 hour... and for early lunch, Cathy and I ran the IM course at her pace. I pushed on the last couple miles of downhill. Just swam... I did most of it in 250 yd segments. First 500 yd was a warm-up, next 250's were a hard push, Next 500 yds easy, and then the next 250's a hard push. 200 yd cool down. Most of my 250's were under 4 minutes. Leg 29 - 4.4 miles at a 35:11 time (8:00) All Uphill!!!! This leg was rated hard, and I ran hard and had 8 kills, I just chased slow runners...The numbers were getting few to pass by this point of the race. Easy run with Cathy and Mike on a beautiful trail along a river in Bend Oregon.